creative high quality science with relevance to disease remains our core business and increasingly we participate in the application of these discoveries. to be a model for the benefits of seeking efficiencies of scale, sharing and collaboration, which will be seen in the future with the Aikenhead Centre for Medical Discovery. One of the administrative staff who contributed to the merger as well as many other projects at SVI over the last 17 years is David Rees, who recently retired from his role as SVI’s Finance Manager. An organisation could not hope to have a more loyal senior administrator and we wish him all the best. David Rees’ successor, Maria Pineda-Haufe. This week we also welcomed Madeleine Whiting, our Foundation Development Director, back from maternity leave. SVI’s financial position remains very strong despite some remarkable pressures, including low interest rates and low rates of grant funding success. Obtaining grants from the NHMRC remains very tough indeed (about a one in eight success rate this year). The researchers who received grants from the NHMRC and other agencies should be very proud of their achievement. We hope that the Medical Research Future Fund will relieve some of this pressure. We are always on the lookout for other sources of income, especially philanthropy, and we are intent on keeping our costs under control. We are also well positioned to embrace the innovation agenda that has become talked about so much in recent weeks. SVI is in very good hands today with an excellent Board, sound finances and outstanding staff. We have a great reputation in the scientific community for our high quality research and our integrity. Our goal, as ever, is to improve the treatment of common diseases and to do so we need to nurture the scientists that contribute so much. We hope that you will help us go on to greater things in collaboration with our many partners, especially those on our campus. Thanks to you all for your help and support this year. SVI researchers were awarded more than $3million worth of funding in the latest round of National Health and Medical Research Council grants. This included Project Grants to Professor Michael Parker (Alzheimer’s), Dr Jon Oakhill (type 2 diabetes) and A/Prof Carl Walkley (cancer); a Career Development Award to A/Prof Carl Walkley and two Early Career Fellowships. A/Prof Jörg Heierhorst was awarded a grant from Worldwide Cancer Research for his research into the roles of the proteins ASCIZ and DYNLL1 in the development and therapy of B cell lymphoma. Professor Michael Parker was recognised for his contribution to Australian medical research, with his election as a Fellow of the Australian Academy of Health and Medical Sciences (AAHMS). The SVI Charity Golf Day raised $73,000 in 2015, bringing the sum of money raised over the last 8 years to more than $640,000. The SVI Support Group celebrated 26 years of support for SVI at its Annual Dinner in 2015 – the Group has raised more than $350,000 to support student scholarships at the Institute. Dr Andrew Sutherland, postdoctoral fellow in the Immunology and Diabetes Unit, was the recipient of Diabetes Australia’s 2015 Millennium Award, which will provide him with $150,000 of funding over 2 years. Much recent media interest has focused on a new type of cancer treatment known as immunotherapy, which involves convincing the body’s own immune system to recognise and destroy cancer cells. Central to this treatment is harnessing the power of a particular immune cell called a dendritic cell. In October this year, Dr Mark Chong’s group published a paper in the prestigious journal Nature Immunology, which confirmed the key role of a protein called Drosha in the development of the cells. “Dendritic cells are the sentinels of the immune system. They roam the body looking for signs of infection or damage. Their job is then to alert other cells of the immune system, triggering a domino effect of immune activity,” says Mark. One of the questions in dendritic cell biology remains exactly how development of the cells is controlled. Mark’s lab discovered that an enzyme called Drosha is required to blunt the activity of certain genes that prevent the development of dendritic cells. They discovered this by creating mice that lack Drosha and investigating the consequences on the development of the cells. Mark explains that when Drosha was not there to cut up the gene products, the proteins they encoded went on to inhibit the development of dendritic cells in the mice. One of the genes, called Todr1, had not previously been described. Mark says that the group is now delving further into the role of these genes, with the hope of casting light on dendritic cell development and possibly aiding in the development of more effective therapies for diseases such as cancer. Professor Michael Parker, in collaboration with scientists at the Bio21 Institute, University of Melbourne and the University of Oklahoma in the USA, has shown how the bacteria Streptococcus pneumoniae assembles its arsenal of proteins to breach the membrane of human cells. Infection by S. pneumoniae causes a range of serious human diseases including pneumonia, bronchitis, bacterial meningitis and sepsis. The bacteria are responsible fora quarter of the deaths of young children in the developing world. It has been known for some time that the bacteria cause cellular damage via a toxin called pneumolysin. Pneumolysin is made up of individual protein components that assemble into a superstructure. This structure punches a hole in the wall of the infected cells, causing them to disintegrate. Using the facilities at the Australian Synchrotron, SVI researchers were able to show for the first time the initial critical steps that occur in the formation of the superstructure. The emergence of drug resistant pneumococci and the poor efficacy of current vaccines have prompted the search for vaccines and drug targets against the bacteria. Michael says that this research provides a framework for the design of new vaccines and drugs to combat pneumococcal disease. In a joint effort, SVI researchers, in collaboration with a team from Duke University in the USA, have found that loss of an enzyme called CaMKK2 causes anxiety and manic-like behaviour in mice. CaMKK2 is found in the brain and acts as a molecular switch, decoding chemical signals initiated by calcium to control a range of important bodily functions. Mutations in CaMKK2 have been linked with anxiety, bipolar disorder and schizophrenia, as well as other diseases of the brain in humans. SVI’s Dr John Scott and Professor Bruce Kemp, with colleagues at Duke University in North Carolina led by Dr Anthony R Means of the Department of Pharmacology and Cancer Biology, have been studying how CaMKK2 works at the molecular level. Their research published in the journal Scientific Reports is the first to show a direct link between loss of CaMKK2 and anxiety. Anxiety is one of the most common mental health conditions. It affects around 1 in 4 people in Australia and the USA and places a large social and financial burden on society. Dr Michelle So is an endocrinologist, having graduated with a Bachelor of Medicine and Surgery from the University of Melbourne in 2006 and attaining her Fellowship of the Australian College of Physicians in 2015. She commenced a PhD with Dr Stuart Mannering in 2015, focusing on the immune basis of type 1 diabetes. My childhood ambition was to... be a teacher. I had very inspiring primary school teachers who were great role models. My first job was... waitressing at a local Chinese restaurant. My worst job was... waitressing at a local Chinese restaurant! Physically demanding, underpaid, and the customer is not always right! The experience definitely spurred me on to study harder! I got into research because... I wanted a deeper understanding of type 1 diabetes as a disease, a greater appreciation of the processes and techniques behind modern day medicine, and to be able to contribute to the endeavour to cure type 1 diabetes for the sake of the many patients who suffer greatly despite all that we currently have available to treat the condition. If I wasn’t doing research, I would... have more time to play with my adorable nieces and nephew! If I could live anywhere I would choose... Melbourne. The most liveable city in the world! PhD student Christina Vrahnas has been working to understand what it is within the molecular structure of bone that gives it strength. She has focussed the strongest beam of light in the southern hemisphere, at the Clayton Synchrotron, on thin sections of bone in order to understand the structure of the matrix within. One of the first in Australia to combine the Synchrotron with other techniques to examine the internal composition of bone, Christina has compared very small regions (about half the thickness of a human hair) of new versus old bone from mice. “We couldn’t do this using the equipment we have in the lab at SVI, because it simply isn’t powerful enough. It was an exciting experience working at the Synchrotron because I knew that the work I was about to do was unique,” says Christina. Christina explains that she has shown that carbonate, a component of the mineral within bone, plays a significant role in determining the ultimate strength of bones in the mice they study. She was also able to identify how the composition of bone changes as it matures, which may give important clues to its strength. Christina says that the ultimate aim of her research is to develop new therapies to help people affected by osteoporosis. "I was diagnosed with osteoporosis in 2009 just after my 61st birthday. During an annual check-up with the doctor and whilst chatting about family I happened to mention that my 91 year old mother had a history of osteoporosis. My doctor then encouraged me to do a bone density test called a DEXA, which is a type of x-ray. The next day, I received the results. I was shocked and horrified, as I’d always had plenty of calcium and thought of myself as reasonably healthy. I was aware of osteoporosis; my mother had developed a stooped posture later in life. I hadn’t had any symptoms, and if I hadn’t mentioned mum’s story to my doctor I may not have been tested. Once I was diagnosed I went to see an endocrinologist, who prescribed a drug that helps to slow down bone loss and to increase bone mass. She also suggested taking a daily calcium and vitamin D supplement. As weight-bearing exercise is recommended, I do clinical Pilates twice per week and go for walks when I can. I have to remain upright and can’t eat for 30 minutes after taking my medication, so during that time I take my walk. In terms of my future health, I don’t have any particular worries. Having reached my mid 60s, I hope to live to a reasonable age. I don’t want to get the stooped back my mother had, so I’m motivated to take my medication and do my exercise. I really hope that in the future, medical researchers discover ways of preventing osteoporosis from developing altogether." Researchers in SVI’s Bone Cell Biology and Disease Unit have identified new therapeutic targets that may be used to treat osteoporosis by studying the cells that build bone (osteoblasts), the cells that destroy bone (osteoclasts), and the way these cells interact with each other and their environment. Ultimately, their aim is to identify new ways to promote bone formation. The SVI Support Group held its Annual Black Tie Dinner at The Athenaeum Club on October 15th. In the 26 years since its inception, the Group has raised more than $350,000 to support Student Scholarships at SVI through donations raised at their annual event. Joined by this year’s cohort of SVI Student Scholarship recipients, attendees heard from Chair of the SVI Support Group, Claire O’Callaghan, from SVI Director, Tom Kay, and from Scholarship recipient, Ashleigh King. Ashleigh thanked the Group, whose fundraising efforts have supported a total of 30 Honours and 35 PhD students to date. For some of the recipients, their SVI Student Scholarship will be the first of the many accolades they will receive over their careers. On the night, Claire said that the Group is proud to be investing in the future of medical research for the community. SVI would like to acknowledge all those who have donated to scholarships at the Institute, and thank the SVI Support Group for their loyal support. The support of 90 keen golfers and 21 sponsors at SVI’s 8th annual Charity Golf Day on Monday October 26th helped raise more than $73,000 for medical research at the Institute. While the weather didn’t cooperate this year, the overcast skies, showers and windy weather didn’t deter the players or dampen their spirits. The Contango team of William Laister, Alistair Drummond, Justin Farley and Mark Kerr won the Jack Holt Trophy for finishing first on the day with a score of 55. The BMW team, consisting of Guy Angwin, Peter Small, Peter Barrie and Geoff Briscoe, were hot on their heels with a score of 56.25. “On behalf of SVI, I’d like to thank our Sponsors, particularly Platinum Sponsor Macquarie Leasing and Silver Sponsor Maxxia for their support of SVI’s Golf Day,’” said Tom Kay. “Funds raised at this event have a great and ongoing impact on the Institute. Each year we hold this event we see that there is strong support in the community for medical research in general, and SVI in particular, which is great. The launch of the HMSTrust Biobank on Tuesday September 29th is an example of the collaborative and innovative approach to medical research that SVI and its partners take in order to understand, prevent and treat diseases such as cancer, heart disease and diabetes. A Biobank is a facility that allows the storage and collection of human blood and tissue samples. These samples can help researchers confirm or clarify results in human tissues, which may then lead to new treatments. 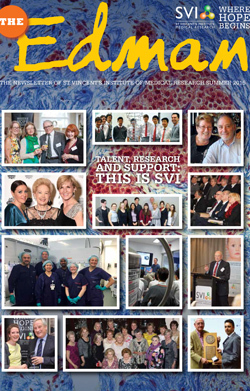 “This project wouldn’t have been possible without the support of the Helen Macpherson Smith (HMS) Trust, the Marian and E.H. Flack Trust and our clinical partners, St Vincent’s Hospital Melbourne,” said SVI’s Director, Professor Tom Kay. At the launch, the Chair of the HMSTrust, Dr Philip Moors AO, said he was delighted to see the project come to fruition. The HMSTrust Biobank is being hosted by the NRL, a division of SVI. Formed initially to develop and provide rigorous quality control processes during the HIV/AIDS epidemic, it is a WHO Collaborating Centre for Diagnostics and Laboratory Support for HIV and AIDS and Other Blood-borne Infections. Ricky and Amanda Smorgon’s son Jesse raised $12,928 in memory of his grandmother at his Bar Mitzvah in September. In lieu of gifts, Jesse asked for donations to the Roslyn Smorgon Memorial Fund, which was set up at SVI in 2008 to support SVI’s cancer research. We are grateful to Jesse for his generosity in choosing to support SVI as part of his Bar Mitzvah celebrations, and are certain Ros Smorgon would be immensely proud of him. Thanks also to YLC Victoria for supporting type 1 diabetes research through their Science Freaktion event on Friday October 30th. Their fundraising efforts delivered an impressive $8,000. The SVI Breakthrough Committee also showed their support of SVI by holding an exclusive screening of the new James Bond film, Spectre, at the Kino Cinema on the 15th of November. The Breakthrough Committee was formed in 2014 with the aim of raising awareness of, and funds for, the Institute. The screening was a great success and raised $2,000 for SVI’s research, adding to an impressive total over the last 2 years.